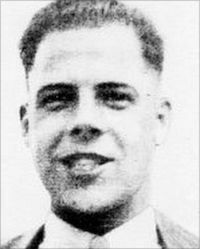 On this date in 1952, poultry farmer and burglar Alfred Moore hanged at Leeds (Armley) Prison for shooting two Huddersfield policemen dead. Many believe he was wrongly convicted. Suspected (accurately) of robbing several rural domiciles around Kirkheaton in West Yorkshire, Moore’s farmhouse had been staked out late one night in 1951 by ten plainclothes cops hoping to catch the guy coming or going. Near midnight, two of their number challenged someone approaching. Was this the master criminal? Several shots rang out in the gloom, and the midnight rambler fled into the night. By the time their comrades reached them, Duncan Fraser lay dead while Gordon Jagger was mortally wounded. The latter man would live on several more hours, enough to provide a deathbed identification of Moore as the shooter. That was damning enough to hang Moore at the time. These innocence claims, latterly supported by some Yorkshire police officers, have been welcome news to Moore’s descendants; however, as of this writing, the official reviews of the Criminal Cases Review Commission which could potentially queue Moore up for formal posthumous exoneration have failed to persuade authorities.